University of Notre Dame network physicists Mária Ercsey-Ravasz and Zoltán Toroczkai of the Interdisciplinary Center for Network Science and Applications, in collaboration with food science experts, have recently published a rigorous analysis of the international food-trade network that shows the network’s vulnerability to the fast spread of contaminants as well as the correlation between known food poisoning outbreaks and the centrality of countries on the network. Together with food science experts József Baranyi, from the Institute of Food Research in the U.K., and Zoltán Lakner, of Corvinus University in Budapest, Ercsey-Ravasz and Toroczkai recently published their results in the journal PLoS ONE. As the world’s population climbs past 7 billion, the sustainable production and distribution of food is balanced against the need to ensure its chemical and microbiological safety. 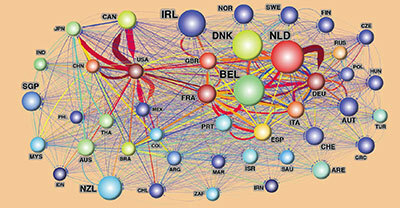 The new paper maps the international agro-food trade network (IFTN) — a highly complex and heterogeneous system formed around a core group of seven countries, each trading with more than 77 percent of the world’s nations. Since any two countries in the IFTN have only two degrees of separation on the network, the IFTN is capable of spreading a foodborne contaminant very efficiently. It also tends to mask the contaminant’s origins once the system is compromised, since so many network paths run through the central nodes. By 2030, food demand is expected to increase by 50 percent. Global food transport has been increasing at an exponential rate since the 1960s — faster than food production itself. As the system grows, so does pressure on regulation and surveillance organizations to track contaminants and prevent deadly outbreaks, such as the 2011 events in the U.S. (Listeria monocytogenes_) and Germany (_Escherichia coli). While the paper does not predict an increase in food poisoning cases, it does predict significant delays with serious potential consequences in the identification of the outbreaks’ sources — calling for an interdisciplinary and incentivized approach to the understanding of the IFTN that will build on its identification of the network’s critical spots. The paper, “Complexity of the International Agro-Food Trade Network and Its Impact on Food Safety,” was published in PLoS ONE as part of an international research collaboration between the aforementioned institutions. Ercsey-Ravasz is currently at Babes-Bolyai University in Cluj, Romania. Originally published by Marissa Gebhard and Rachel Fellman at newsinfo.nd.edu on June 07, 2012.